MIT will collaborate with a new startup company to make fusion energy a reality. For decades, fusion energy has featured oddly in discussions of our nation’s energy future — it has been both an ultimate goal and an easy punchline. On the one hand, fusion has held the promise of providing a virtually unlimited source of safe, carbon-free energy; on the other, the sardonic quip has been that it’s always 30 years away. The joke part is about to change. Fusion is the natural process that powers the sun and stars. In fusion power plants, the fuel is a form of hydrogen, found in water, which is so abundant as to make it effectively inexhaustible. The power is produced when these hydrogen atoms “fuse” together to form heavier elements, such as helium. It has long been recognized that fusion is a clean, carbon-free source of energy that can power the world — recognized, but not achieved. Fusion is difficult to achieve on Earth because it requires control of a 200-million-degree plasma that produces energy. The main problem has been to get plasmas to generate more energy than it takes to run them. The federal government has funded basic research on fusion for decades. Now, a technological breakthrough has put fusion energy within reach. That breakthrough is, in turn, stoking the appetite of the private sector. Researchers at MIT have designed a way to use high-temperature superconductors to produce powerful magnetic fields that provide superior confinement of the hot plasma — enabling a net energy fusion device at much smaller scale than did previous experiments. The MIT design uses established science for the plasma confinement, and thus puts fusion power plants within reach on a faster time-scale than previously thought possible. Given this important scientific advance, we at MIT believe it is time to move fusion energy decisively forward. We will do so by collaborating with a new startup company, Commonwealth Fusion Systems, created by former MIT researchers and students, to make fusion energy a reality. This announcement is as much about a transformation of the energy market as about advances in the technology that drives it. CFS has attracted eight-figure investments from the European energy company ENI as well as from US investment funds. With that funding, CFS will work with MIT scientists to develop the superconducting magnets that are key to advancing this pathway to fusion energy. With the magnet technology in hand, MIT and CFS will build a new kind of fusion experiment we are calling SPARC, a prototype that would demonstrate, for the first time, control of a fusion plasma that produces more energy than it consumes. This collaboration will enable technology and business-model development over the decade-plus time horizon we expect it will take for fusion to become a source of scalable energy. In some ways, fusion is the ultimate “tough tech” challenge, requiring sustained investment and support to reach maturity. Large-scale transformations of the energy sector — whether the advent of steam power, fossil fuels, or electricity — have always taken place over decades. If we succeed, CFS, building on sustained investment by the government in basic research, could seed an entirely new industry, making regions far from today’s petrochemical centers — notably, New England — new hubs in the world’s energy future. More important, this commercial and investment success would benefit all of humanity by providing carbon-free power at scale in time to make a difference against climate change. SPARC will complement existing approaches to achieving fusion. The biggest current effort to make fusion a reality is ITER, a giant international research effort located in the south of France. ITER expects to demonstrate energy production from a fusion plasma after 2035. CFS, through SPARC, seeks to demonstrate fusion energy by the mid-2020s. Its use of magnet technology that wasn’t available when ITER was planned means that SPARC and ITER will be based on the same science but foundationally different technology approaches. This is good news; fusion is far too challenging for its pursuit to be limited to a single experimental design. Should either of these efforts succeed in achieving scalable fusion energy, it will benefit all of us, and the long-term health of the planet. We should be equally cheered by private-sector interest in fusion. To take on climate change on a timescale that would avoid the most damaging impacts, we need bold action that brings together federally funded science, research universities, and industry. SPARC fits that bill. With brilliant researchers powered by serious long-term investors and by companies that know how to provide energy at scale, we give ourselves a fighting chance at making — and altering — history. 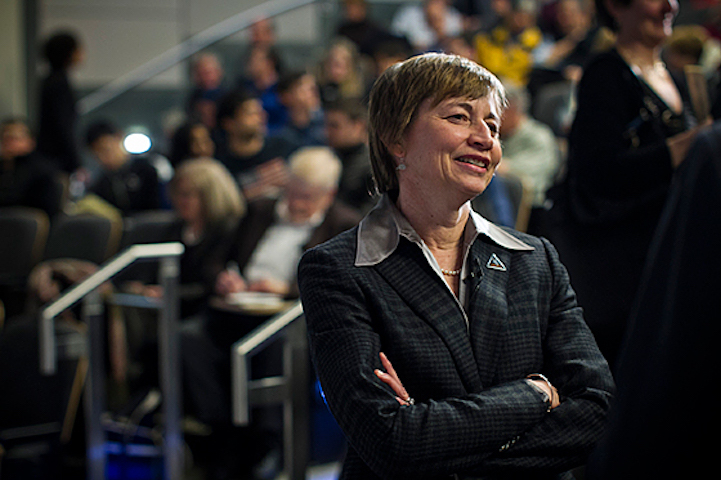 Maria T. Zuber is the E. A. Griswold Professor of Geophysics and Vice President for Research at MIT. Maria Zuber received her B.A. in astronomy and geology from the University of Pennsylvania. She also earned Sc.M. and Ph.D. degrees, both in geophysics, from Brown University. Zuber later worked at Johns Hopkins University and served as a research scientist at the NASA Goddard Space Flight Center in Maryland. She joined the faculty of MIT in 1995 where, as chair of the Dept. of Earth, Atmospheric and Planetary Sciences between 2003 to 2012, she became the first woman to lead a science department at MIT. Fast-track to Fusion - Goal is for research to produce a working pilot plant within 15 years.